They are the two biggest cryptocurrencies on the block. At the time of writing, they have a combined market cap of over $81 Billion. They’re Bitcoin and Ethereum, the two blockchain projects you’ve almost certainly heard of — even if you’ve only just started in cryptocurrency investment. Both projects let you transact anonymously and provide a great return on investment. However, Bitcoin and Ethereum also have features that make them unique from each other. Basically, Ethereum and Bitcoin each use blockchain differently. To understand how they do this, let’s begin by shining a spotlight on both projects’ similarities before stepping back to view the difference between these two cryptocurrencies. Both Bitcoin and Ethereum run off blockchain and its underlying public ledger technology. Each creates a basic token, a Bitcoin in the case of the Bitcoin project and Ether in the case of Ethereum. Traders can buy and sell these tokens on the open market as easily as shares in the stock market. Bitcoin and Ethereum both create tokens for sale on cryptocurrency exchanges —with the price of Ether generally the more stable of the two. For the pure cryptocurrency trader, this is where the story ends. However, if you’re interested in how the two cryptocurrencies work, we’ll need to dig a little deeper. Bitcoin and Ethereum’s essential difference lies in how they are used. Bitcoin is a pure currency alternative. The token exists to supplement the dollars in your wallet and the project exists chiefly to create, secure and track the exchange of those individual tokens on the open market. In other words, Bitcoins exist to be spent. Ethereum, on the other hand, is a smart contract platform. It allows users to enter into an agreement which it then monitors. When one person lives up to their side of the bargain, or when certain conditions are met, the Ethereum platform automatically fulfils the contract — generally through payments made in Ether. The project creates an infrastructure which allows users to enter into those contracts. This is one of the advantages of Ethereum over Bitcoin. Ether tokens raise funds for the Ethereum project. However, an Ether token’s value to users comes from its role as the medium of payment in smart contracts. So, the Bitcoin ledger records that Sarah has transferred one Bitcoin to John. However, if Sarah buys the pizza for one Ether, the Ethereum ledger does not transfer one Ether to John until it records the receipt of Sarah’s pizza. One advantage of Bitcoin over Ethereum is that it has no interest in the underlying transaction. It’s simply a spendable currency. Ethereum, however, is only interested in the trade. It needs to know Sarah got her pizza before John gets his token. This isn’t the only difference between the two cryptocurrencies. While both are based on blockchain technology, Bitcoin and Ethereum have differences in their underlying architecture, which entirely changes the way they process transactions. Ethereum creates a platform and programming language with which users build their smart contracts and distributed apps, while Bitcoin is a pure transactional project. 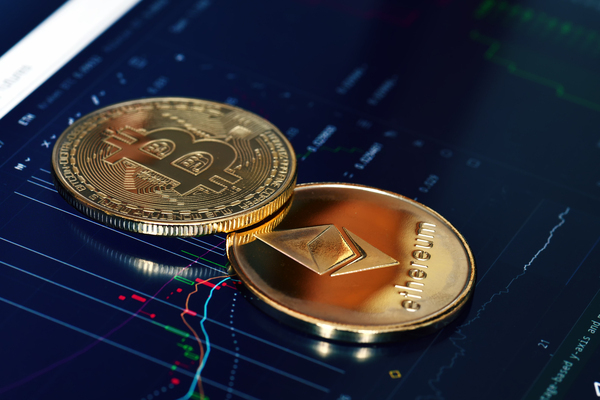 As a result, Ethereum is generally considered the more efficient currency, taking a fraction of the time that Bitcoin does to transfer tokens. Ethereum can also be used to create tokens other than Ether, while Bitcoin only trades in Bitcoin. The technical differences between these projects are significant and have informed much of the development in blockchain technology over the past ten years. Overall, however, Bitcoin and Ethereum are about doing two different things. Bitcoin wants to reinvent the way you think of money. Ethereum intends to reinvent the way you think about contracts. Now that you understand the difference between Bitcoin and Ethereum sign up for free and start learning more about securely buying Bitcoins and other cryptocurrencies.